“My life turned miserable when I got to know about my husband’s relationship with another woman. Each time I questioned him, I was beaten badly. And then came that day that I was dreading. He deserted me and our children, and moved in with that woman,” narrated Renuka Devi, the 28-year-old mother of three, living in a slum in Visakhapatnam city, Andhra Pradesh. 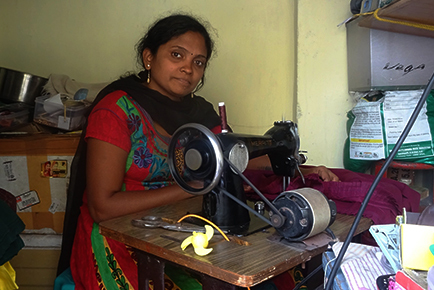 For Renuka, the desertion wasn’t just emotionally shattering; she now also had to earn a living to run the household. “I had never been to school, so I started working as a domestic help. But my monthly earnings of Rs. 1,500 were not enough to take care of my children’s education and nutrition,” shared Renuka. It was during those testing times that Renuka came to know about the work being done by ActionAid India and its ally, Mahila Action, in Visakhapatnam. She thereafter started attending their meetings and learning about her rights and entitlements as a domestic worker. “ActionAid India and Mahila Action helped me face the odds in my life courageously. They also trained me in tailoring and gifted me a sewing machine, which helped me augment my income,” said Renuka. Besides, under Mission for Elimination of Poverty in Municipal Areas (MEPMA), Andhra Pradesh Government’s nodal agency for urban poverty alleviation, Renuka received a training on how to run and manage household appliances. “This training upgraded my skills and boosted my confidence further; I subsequently started getting better-paying work opportunities as a domestic help. Besides, with Mahila Action’s support, I also applied for a loan and bought a marble-floor cleaning machine. As a result, I’m now also getting work orders from malls, big stores and bungalows to clean marble floors. My monthly earnings have increased to nearly Rs. 12,000 and I now have the confidence to raise my children. I thank ActionAid India and Mahila Action for coming to our rescue and bringing back hope into our life,” added Renuka with a smile on her face. In addition to Renuka, more than 250 women from across the slums in Visakhapatnam have been provided trainings on various skills, thereby improving their earning capacity. ActionAid India and Mahila Action have sensitized over 1,200 domestic workers on their rights and entitlements, besides supporting them in advocacy with officials in the Labour Department. The untiring efforts by these empowered domestic workers also led to their registration as a trade union. We are happy to share that more than 500 workers who had been underpaid are now getting minimum wages and several others are covered under social security benefits.